Our public information team recently began work on the massive Horizon Drive Roundabouts Construction project located in Grand Junction. 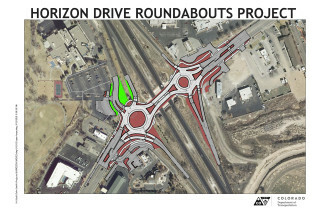 The 12-month project will involve the construction of two modern-style roundabouts that will assist in improving traffic flow and safety, as well as adding environmental aesthetics to the area. The Horizon Drive Business Improvement District has also commissioned the creation and installation of six horse sculptures to the completed product, with the purpose of providing a cohesive look and feel to the area. The team hosted a public open house at the end of September to allow members of the community to get to know the project team and get their questions answered. The impressive turnout shows just how invested the Grand Junction community is in this project, which makes providing comprehensive public information services all the more important.